Many cultures serve similar vegetables and meats in their New Year’s Day celebrations to bring good fortune. During the time of the Pharaoh, black-eyed peas were a symbol of luck and good fortune. The belief was that those who ate black-eyes, an inexpensive and modest food, showed their humility and saved themselves from the wrath of the heavens because of the vanity they might have. In fact, black-eyed peas aren’t a pea at all – they’re lentils. For example, in Brazil and Italy, lentils (money) are served – in Brazil, with rice – which expands when cooked, showing increase – arroz brazileiro; and, in Italy, lentils are eaten with pork sausage, to bring abundance – cotecchino con lenticchie. Pork and sauerkraut (cabbage) are combined in Germany, Poland and Scandinavia. Cabbage represents the green leaves of money. Similarly, throughout Southern United States, black-eyed peas in some variation, with or without ham hocks, and greens have inspired such dishes as Hoppin’ John, that combines peas, rice and ham. 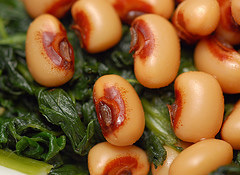 As the story goes, black-eyed peas were used exclusively for cattle feed in the old South. During the battle of Vicksburg during the Civil War, the town was under siege for over 40 days. No supplies came in or out. Vicksburg was on the edge of starvation. The people had no choice but to eat those black-eyed peas, therefore starting a southern tradition. Today, black-eyes are eaten every New Year’s Day to bring good luck for the new year. There are, however, beliefs that exclude some foods as bad luck. These include lobsters, they move backwards and chickens, that scratch in reverse. Eating these on New Year’s day might cause a reversal of fortune. Celebrating New Year’s Day with family, friends and food is a time-honored tradition that has included symbols of prosperity and good fortune. Enjoy “what you’ve always done” and, perhaps, add a new tradition in your New Year.